The Trump administration’s attempt to muzzle environmental messages on social media appears to be failing bigly. In the wake of the Badlands National Park Service’s Twitter account having its pro-science tweets deleted (after the Department of the Interior had ordered all Park Service social media accounts to go quiet), “rogue” Twitter accounts have begun to sprout up for the NPS, and now for EPA, USDA and NASA. It’s unclear who’s behind these accounts, but their strong defense of established climate science quickly won them a big following. The AltUSNatParkService Twitter account (@AltNatParkSer) was launched on Tuesday, announcing that it has been “activated in time of war and censorship to ensure fact-based education.” As of Thursday morning, they have 980,000 followers — more than double the number of followers on the main National Park Service account (381,000). The EPA operates under the auspices of US Congress to protect human health and the environment by creating and enforcing regulations. Hello. 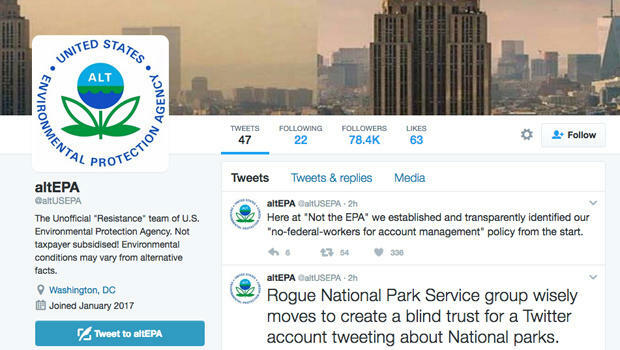 This is the Alternative Environmental Protection Agency Twitter Account activated to circumvent censorship. Two “resistance” NASA accounts also appeared: @RogueNASA and @Alt_NASA. The brouhaha started almost as soon as Mr. Trump was sworn in last Friday, when climate change policy information on the whitehouse.gov website disappeared. Orders were sent to staffs at the EPA, and the Departments of the Interior, Transportation and Agriculture to cease speaking with the press. Health and Human Services employees were barred from speaking with other officials. A subsequent demand was made to remove climate data from the EPA website (though that order has since been suspended). After the main National Park Service Twitter account retweeted pictures of the National Mall, comparing crowd sizes at the Obama and Trump inaugurations, the Twitter account was silenced. In response, someone at Badlands National Park used their park’s account to send out tweets relating to climate change. Those tweets were soon deleted, and a Park Service statement claimed that a former employee not authorized to access the account was to blame. But it inspired other National Park Service Twitter accounts to spout science tweets as well. Golden Gate National Park in California linked to a report by NASA and the National Oceanic and Atmospheric Administration which declared 2016 to be the hottest year on record. It was seen as a repudiation of Mr. Trump’s assertion that climate change is a hoax. Also on Wednesday, the Death Valley National Park account tweeted a photo of a Japanese-American interned at the park during World War II. The tweet came as news spread that President Trump would sign executive orders withholding visas and blocking refugees originating from selected countries from entering the United States. And adding to the list: @AltNIH; AltFDA; AltUSFWSRefuge: and @AltNOAA. When asked by the Associated Press, Tom Crosson, the chief spokesman for the Park Service, said there are no restrictions at the agency on the use of Twitter or other social media accounts. “There’s no gag order on national parks that would prevent people from tweeting,” he told the AP.